However, the request awaited approval for months due to the fact that the use of tractors is reported to have led to affect severe damage to the coastal environment. The Minister of Fisheries & Aquatic Resources Development Hon. Mahinda Amaraweera has issued strict instructions to the fishermen engaged in seine fishing to take measures to pull out their nets devoid of causing damage to the coastal environment, considering the fact that the use of winch machine would help pull nets relatively with lesser labor force. 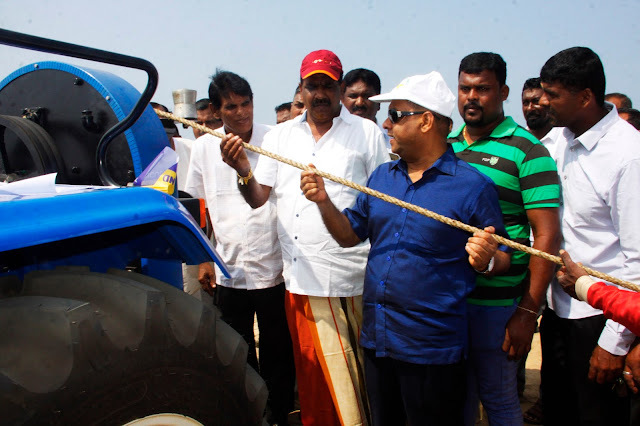 Accordingly, the 40th anniversary celebration of seine net fishermen held yesterday 11th at Udappuwa in Chilaw and the Hon .Minister observed pulling out seine nets in progress by using Winch machine and instructed them to use those machines without damaging the coastal environment. He expressed that strict legal action will be instituted, if illegal seine net practices such as use of tractors to pull out seine are carried out. The State Minister of Fisheries & Aquatic Resources Development Hon.Dilip Wedaarachchi and the Director General of Department of Fisheries were among participants.